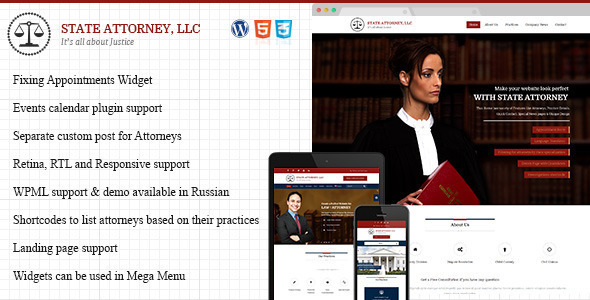 Modern & Professional HTML Template for lawyers, law firms, attorneys, consultants, legal corporations, legal Advisors, justice corporations, agents and for any legal and law related businesses. A professional website that is clean, neat and tidy, which will certainly make the best impression on current and future clients. Templates loaded with more than 10 Unique Page layouts for Practice, News & Events, along with 20 different Short-codes. Each and every available website component is 100% responsive and adapts perfectly for any mobile device.